The case of the Braxton County Monster, or the Flatwoods Monster, is definitely not your average close encounter. The beast was first come upon by a group of boys . It was the evening of September 12 1952, and the group was stationed at the schoolyard when they saw a ball of fire descend into the hills above Braxton County in what appeared to be a fiery crash landing. The boys, led by Freddy Mays, decided to investigate the anomaly and headed up the street, grabbing Freddy’s mom along the way. As they entered the dense forested area, a mist with a foul odor greeted the group. One witness likened the aroma to “when an old TV from back in the day burned out.” Another was sick to his stomach shortly after exposure to the noxious fumes. But the spookiest part was when the group caught sight of a creature from out of this world. Described as approximately 9-12ft tall with reptilian-like scaly skin and a glowing head with shining eyes like an ace of spades. A few in the group described the entity as having long thin arms and two fingers that protruded from the front of the body. Some reported seeing tubes emitting the noxious gas were seen all around the creature forming a kind of skirt or shield, while others said that the bottom half of the creature was hidden by foliage from the dense woods. The entity stared at the group with hollow glowing eyes before it began to smoothly glide towards them, emitting a piercing noise all the while as it drew closer and closer. Needless to say, the group scrambled out of the woods as fast as they could, none looking back to see if the creature gave chase. Once safely away from the scene of the incident, the group noticed a splash of oil was on the mother’s apron and one of the boys also vomited after the incident. Interestingly, a few locals as well as the sheriff and a deputy (who were summoned to investigate a reported airplane crash in the area), searched the site but "saw, heard and smelled nothing." (monsterquestdoc) The following day, A. Lee Stewart, Jr., from the Braxton Democrat discovered "skid marks" in the roadside field, along with an "odd, gummy deposit" -- traces attributed to the landed "saucer" (Barker 1953). The two described how they were driving when suddenly their car lost power. Crawling to a stop, George pulled them off to the side of the road and decided to pop the hood to investigate the cause of the stall. As he got out of the vehicle, he was greeting by a sulfurous gas that caused him to cough and stumble back. As he regained his composure he saw the same reptilian creature emerge from the woods and descend upon the couple. As he scrambled back into the car, they both witnessed the creature approach the front of the vehicle, laying two tendril-like fingers on the hood causing it to sizzle and burn the paint clean off to the metal. The entity then glided back into the woods from where it came. Over the years the case of the Flatwoods Monster has been investigated by top names in the paranormal field, including Ivan T. Sanderson and Joe Nickel. Sanderson, a well known cryptozoologist, was in the area at the time of the flap and concluded, after his own investigation and interviewing several witnesses, that the UFO was most likely extraterrestrial in origin. Find Sanderson’s original 1953 report here. Joe Nickel of the Centre of Skeptical Inquiry first coined the idea that an owl was responsible for the slew of sightings in the Flatwoods area of West Virginia. Nickel was convinced that an owl perched on a nearby branch would mimic the appearance of the Flatwoods monster, adding that the hollow glowing eyes, the gliding movement, the piercing sound, the arms on the front of the body as opposed to the side are all characteristic of the behaviours/physiology displayed by the species. However, this falls short in many regards. One must also consider the mist with its sulphurous odor pervasive in multiple accounts, along with the tubes/suit seen by witnesses as well as the creature’s scaly reptilian appearance. Could local residents of the Braxton County area have mistaken feathers for scales? Something else to consider in regards to the owl hypothesis is the Sitoski sighting. The report from the couple offers an extended encounter – one that I would say takes some serious discounting of witness credibility if you’re going to stick to your guns with the owl hypothesis. The couple experienced something incredibly common in relation to extraterrestrial and UFO sightings: mechanical failure of their vehicle for an inexplicable reason. This fact alone singles out this case as displaying classic signs of a Close Encounter with a UFO of extraterrestrial origin. The sighting occurred during twilight and was witnessed by both individuals who offered detailed descriptions of the being they encountered. It is pretty incredible to think that two adults with sensible minds would mistake a common owl for an extraterrestrial entity. And on top of that, what kind of owl comes swooping out of the safety of the woods to attack a car? As well, the sulfurous gas described by the Sitoski’s matches with the original sighting described by Freddy May’s group. Is there a species of owl out there known to emit this type of gas? I think not. The presence of noxious gas in these sightings leads into another prominent hypothesis: the idea that the release of coal mine gases caused mass hysteria in the Flatwoods area, causing people to believe they had seen a creature that actually does not exist. While gases might explain the glowing orb features described by witnesses, it would also put a lot of people into the camp of outright ‘delusional’. This also would not explain all of the physical evidence left behind, including the oil stain on Mrs. May’s apron. 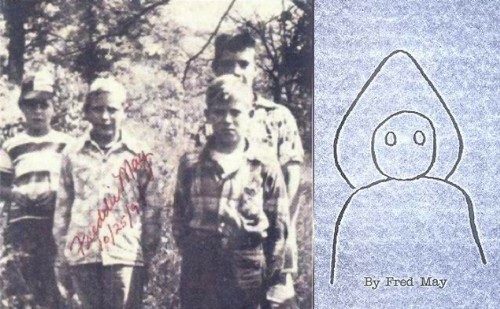 The legend of the Braxton County Monster remains alive and well in the Flatwoods area of West Virginia. In fact, a sighting occurred in the mid-2000’s, when hunter Joe Smith was hunting deer in Braxton County when he saw what appeared to be three humanoid creatures with heads like an ace of spades. Smith described how the eyes were like openings with eyes in behind them, mirroring the hollow-eyed description offered decades earlier in the 1950’s. This recent sighting has yet to have any corroboration with any other locals in the area. The Flatwoods monster since faded into history, but the iconic monster remains the the forefront of the West Virginia community it terrorized so. A proud statue stands tall in the middle of town, and an annual festival celebrates the legacy of the legendary Flatwoods Monster.